﻿ Perfect-Pilots - the home of bespoke model pilots! 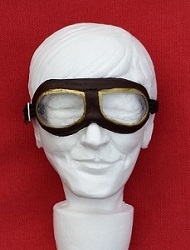 Available in a growing range of styles to suit different aircraft, ages and pilots, our 1/4 scale goggles kits provide the finishing touch to your pilots. They are supplied as kits requiring trimming, painting and assembly, or can be supplied fully assembled. Kit contains - 1x goggles (unpainted and requiring final trimming to suit pilot head), 1x length elastic, 1x metal buckle adjuster. Unless otherwise arranged in advance, black elastic will be provided. These goggles kits add negligible weight and only weigh a few grams! 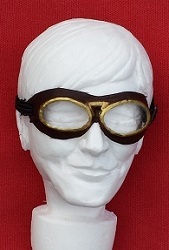 The Buy Now option is intended for UK customers and single goggles kits.